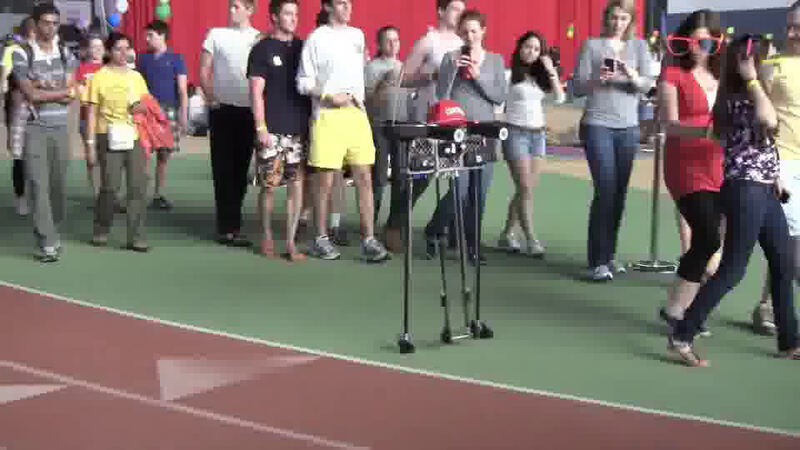 The robot Ranger, which set an untethered walking record in Barton Hall. 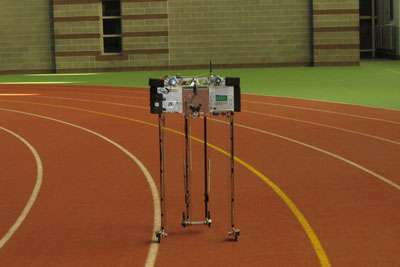 (PhysOrg.com) -- Pulling an all-nighter and then some, the Cornell robot Ranger set a new world record May 2 by walking 40.5 miles on a single battery charge without stopping or being touched. Ranger, built and programmed in the Biorobotics and Locomotion lab led by Andy Ruina, professor of mechanical and aerospace engineering, started on the Barton Hall track just after 2 p.m. May 1 and came to an abrupt stop at 9 p.m. May 2 after 30 hours, 49 minutes and 2 seconds of nonstop walking. It covered the 307.75 laps (0.13 miles per lap) at a 1.3 mph amble. To warm up for the feat, Ranger -- donating a participation fee -- walked 30 laps in the American Cancer Society's Relay for Life the day before. The robot Ranger walked 40.5 miles around the Barton Hall track, with students, faculty and staff taking shifts to steer. From left, graduate student Pranav Bhounsule, Violeta Juarez Crow '12 and Lauren Min '13. and going. 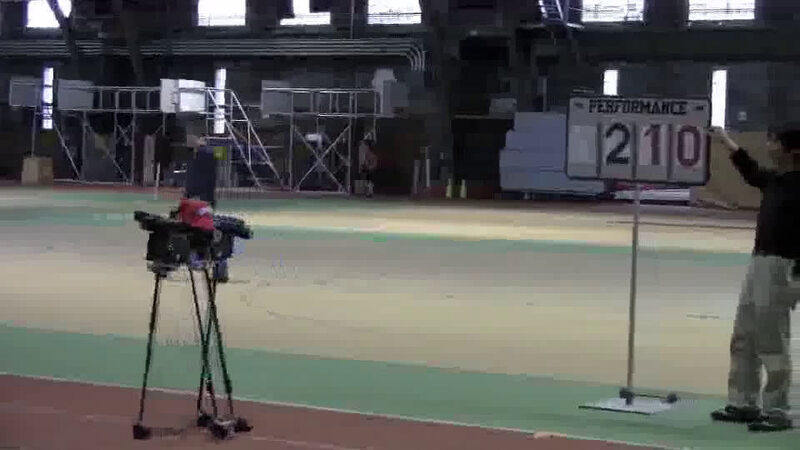 In contrast, at the much-publicized world's first robot marathon in Osaka, Japan in February, robots were repeatedly recharged. "We were getting pretty tired by the end," said Violeta Juarez Crow '12, an electrical engineering major who steered the robot for dozens of laps around the Barton track. The overall goal of the National Science Foundation-funded research project is to understand walking by reinventing it, Ruina said. Ranger has six small onboard computers executing about 10,000 lines of computer code. The programs run in a repeating loop every 1/500th of a second. The robot also has dozens of electrical and mechanical sensors. The electronics used 4.7 watts. "It took a bit of effort to keep the computation, sensing and communication energy use low," said Jason Cortell, a research support specialist who designed most of the electronics on Ranger. "We hope to use what we have developed for more complex robots." Watch Ranger practice walking around the Barton track at the American Cancer Society Relay for Life, April 30. The robot's total weight is 22 pounds, of which 6 pounds are the lithium-ion batteries that power the electronics and the motors. One of these motors extends the outer ankles, another extends the inner ankles and a third swings the legs. A fourth smaller motor twists the inner legs for steering. The motors consume an additional 11.3 watts. At 16 watts total, the specific cost of transport (COT, energy per unit weight per unit distance) was a relatively stingy 0.28 joules per newton-meter. Most robots use much more energy (with a typical COT of 1.5 or more), Ruina said. Ranger still isn't as efficient as a typical human, who walks with a COT of about 0.2. Ranger's present COT of 0.28 is less than its COT last summer of 0.49. "We've improved the control in various ways since then," said Pranav Bhounsule, the graduate student in charge of the control system. "But I think we can still do better." "Our challenge is to lower the energy use while still maintaining balance," Ruina said. "The achievement is to have gone 186,076 steps on 5 cents worth of electricity, and without falling down." "If we try for another record it will be with automatic steering," Ruina said. "After about 24 hours of walking in circles, we half hoped the thing would fall on its face."